Prostaglandin E2 (PGE2), is an inflammatory molecule produced by cyclo-oxygenase 2 (COX2) enzyme. 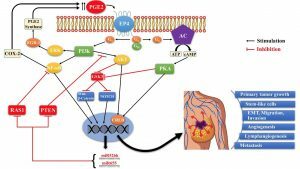 PGE2 regulates growth and development and essential for survival. Both COX2 and PGE2 promotes breast cancer and induces tumor promoting micro RNA in breast cancer. We have shown that both COX-2 and PGE2 regulates cancer stem cells (CSC). 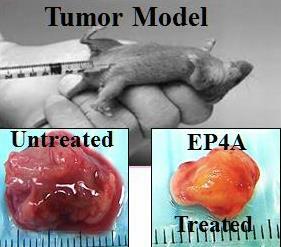 Currently, we are investigating if PGE2 can regulate vertebrate growth and angiogenesis. And the potential of miRNA as blood biomarker. miRNAs are short noncoding RNAs, involved in embryogenesis, tissue homeostasis, and disease pathogenesis. Micro RNA: We think the bidirectional communication between tumor and its microenvironment everyone takes part to promote cancer. While CSCs help production of oncogenic miRNAs; miRNA transported via exosomes in the body circulation and some circulating tumor cells carrying these miRNAs might act as messenger and helps metastasis by abrogating tumor suppressor gene functions. Or these miRNAs might itself induce the production of CSCs, tumor growth and metastasis; mechanisms not clearly known. With miRNA micro array we have identified two such miRNA (miR526b and miR655) high in COX- expression by stimulating the EP4 receptor in breast cancer. EP4 is a G-coupled receptor required for cell survival and proliferation. Micro RNA might promote angiogenesis by secreting vascular factors or stimulators in the tumor micro-environment to induce the growth and migration of endothelial cells which in turn promotes angiogenesis. We are investigating these phenotypes with miRNA high cancer cells and primary HUVEC cells. 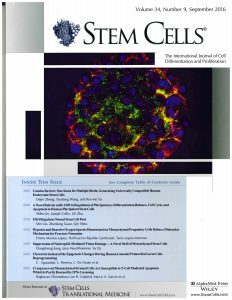 Image adapted from Majumder et al, Stem Cells, 2016, selected for the cover page of the journal. Cell Secretome: The cell secretome is a pool of proteins secreted by cells into the extracellular space. A significant portion (~13-20%) of the human proteome consists of secretory proteins. The secretory proteins play important roles in cell migration, cell signaling, and cell-cell communication. Using Mass Spectrometry analysis in collaboration with Dr. Chen in Chemistry Department, we are investigating if any significant protein fold changes among poorly metastatic and aggressive breast cancer cells. Protein pathway analysis helps us to better understand the properties and different natures of breast cancer cells. We might identify a novel protein with a potential therapeutic target. Targeting EP4: EP4 is a G-coupled receptor required for cell survival and proliferation. Inhibition of EP4 could abrogate all COX-2 induced functions including cancer stem cell reduction and miRNA downregulation. Over the decade immense research has been done on an inflammation-associated enzyme called cyclo-oxygenase-2 (COX-2), which produces PGE2 and activated its receptor EP4. This will activate VEGF, PI3K/AKT, and ERK pathways. COX-2 expressed by about half of primary human breast cancer cases drives tumour progression and spread to other tissues (metastasis) by multiple mechanisms. Recently, we discovered that COX-2 induces CSCs via EP4/PI3K/AkT/NOTCH/WNT pathways and also induces miRNA. The image is taken from Majumder et al, IJMS, 2018. 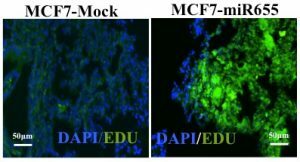 Efficacy of Drugs: We also found that drugs blocking EP4 receptor were highly effective in controlling breast cancer growth, metastasis and stem cell replication and miRNA expression in experimental animals, without hurting normal stem cells. These drugs are future candidates for human trials, in combination with traditional therapies. Images adapted from Majumder et al, Cancer Science, 2014, Stem Cells 2016. Angiogenesis Assay with Zebrafish model: Danio rerio, better known as zebrafish, have emerged as a popular model for studying developmental processes and human disorders. Zebrafish share a high level of genetic and physiologic homology with humans, including the brain, digestive tract, musculature, vasculature, and an innate immune system. Moreover, approximately 70 % of all human disease genes have functional homologs with the species. 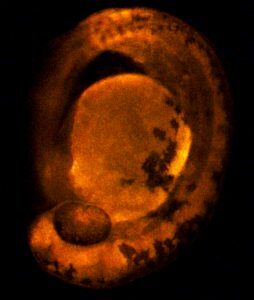 Their extrauterine development is rapid; the major organs of the zebrafish are fully developed by 24 hours post fertilization (HPF), and they are ready for use in larvae experiments by 3 days post fertilization (DPF). Zebrafish larvae are transparent during the early stages of life, therefore easy to observe their movement and development under the microscope. In collaboration with Dr. LeMoine we are using zebrafish to investigating the regulatory role of Prostaglandin E2 (PGE2) and miRNA in vertebrate development, mainly in the following domains: (1) evaluating growth and angiogenesis with PGE2 microinjection; further we shall conduct (2) tumor metastasis; (3) anti-tumor drug screening and (4) cancer drug-related toxicity. 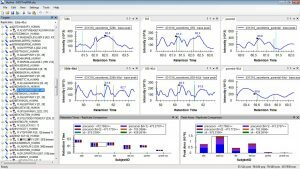 miRNA as breast cancer biomarker: We have identified two oncogenic tumor promoting miRNAs, miR526b and miR655 in human breast cancer. We have established that this two-miRNA expression promotes tumor metastasis in vivo in a mouse model (figure showing lung metastasis in NOD/SCID mouse injected with miRNA high breast tumor cells). Both miRNAs are significantly high in human breast tumor tissues compared to normal tissues (figures adapted from Majumder et al, Sci Rep 2018). In collaboration with Dr. Lala at the University of Western Ontario and Dr. Brackstone at the London Regional Cancer Program, we have access to human blood plasma. 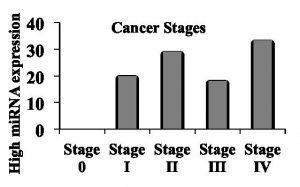 Our current focus is to quantify and validate this miRNA in human blood plasma and investigate if this miRNA expression in the plasma can be co-related with cancer progression. Once, successful this miRNA can serve as a liquid biomarker for breast cancer. Collection of blood is less invasive then tumor biopsy. We shall be able to encourage population-wide screening of breast cancer for early detection. If we can detect early we can increase patient survival.